The Challenge Program, Inc. Christina Kramer - Feeling Good about Community Service - The Challenge Program, Inc.
Community Service is my favorite TCP category. I may be biased because I work in Community Affairs at Range Resources – so I know a little something about how giving back to your community makes you feel. There is an episode of “Friends” (a show that was on way before your time but you can still catch re-runs) called “The One Where Phoebe Hates PBS”. In it, the characters talk about how good deeds are actually selfish because when you do a good deed, it makes you feel good about yourself, or if you’re Joey Tribbiani (one of the characters), you get on TV. You can check out the clip from the show here to see what I’m talking about. The group from “Friends” nailed it though – giving back does make you feel good about yourself. But I don’t think that’s selfish, it’s just an added bonus of doing important work that has a positive impact on communities. Another bonus for you is this: participating in community service projects and volunteering your time to help people who are less fortunate can help you get ahead when applying to colleges or applying for jobs. It’s a win all around! As a Community Affairs professional, I consider myself very lucky to work at Range – a company that places a high priority on giving back. In addition to investing in the infrastructure in the communities where it operates – things like roads and bridges; Range is also committed to protecting and enhancing the environment through partnerships with Washington County and the great county parks around here, and organizations like the National Wild Turkey Federation. Range also gives back through its partnerships with charitable organizations that benefit residents in the communities where Range employees live and work. The company donates to over 300 nonprofits every year, including local first responders, hunger-related causes, the United Way, the United States Marines Toys for Tots, schools and educational programs (like TCP! ), and much more. Range’s partnerships include more than just writing checks, employees back up that funding with strong relationships and hundreds of volunteer hours on different projects. Throughout the year, you’ll find Range volunteers out and about at local schools holding job shadow programs, helping out at community events, bidding on animals in order to raise funds for students at the Washington County Fair Junior Livestock Auction, collecting monetary and food donations on the street for the Greater Washington County Food Bank, building homes with Habitat for Humanity, and participating in local fairs and festivals that are focused on benefiting the community in a number of different ways. Do all of these activities make us feel good about Range? Yep. More importantly, though, those efforts help to make the community a better place for people to live in. You can learn more about Range’s corporate philanthropy here. So, what does this all mean to you as a student? When I’m asked what my most important advice is for students when they are looking to start a career, I always say – “make connections!” Whether it’s through school, internships, networking events or, VOLUNTEER WORK! Get involved with your local food pantry, volunteer fire department, park clean-up crew, or some of the other great volunteer opportunities available in your area. It’s where you’ll meet other civic-minded people, including professionals and teachers. The people you make connections with will be great references on college and job applications and will often go out of their way to help you connect with potential employers. That’s how I got my job at Range! Also, I’m constantly hearing from colleges and employers that they are looking for candidates with “leadership experience.” As far as I’m concerned, stepping up as a high school student to volunteer in the community sets you apart as a leader. You’re also developing important skills working in the community – time management, event planning, interpersonal communication – you name it. And it all ties back to community service. So in the end, Phoebe and Joey were right. There is no such thing as a selfless good deed. It will make you feel good, plus giving back will help set you apart as a top candidate for post-secondary education and more importantly, a career. If you’re a Washington County TCP student, feel free to connect with us regarding volunteer opportunities that you can participate in with our employees. You can also learn more about careers at Range here. 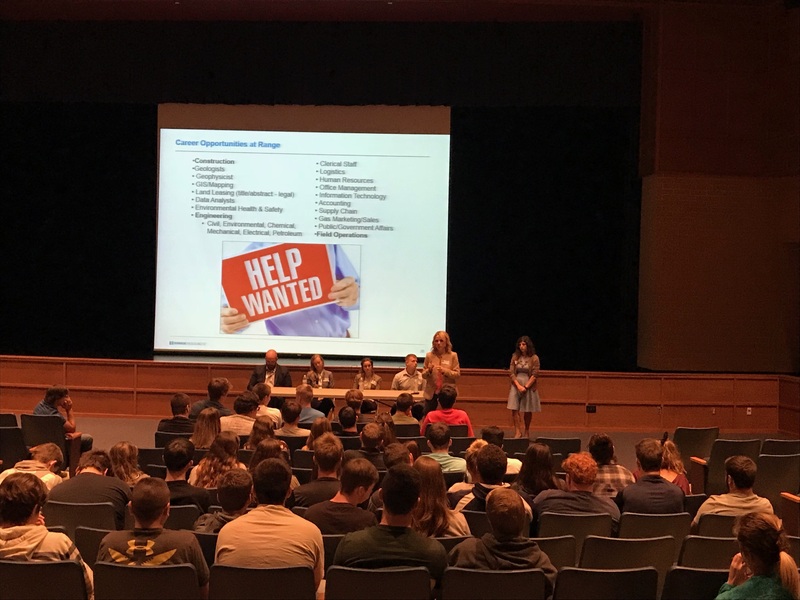 Range Resources partners with Avella High School, Bentworth High School, Burgettstown, High School, Chartiers-Houston High School, Fort Cherry High School and Western Area CTC.